Dongguan Feixinda Precision Machine Science & Technology Co.,Ltd. 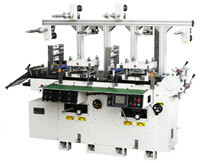 Basic information of multi function die cutting machine of Feixinda Co.,Ltd. 3.Adopt all-in-one automatic induct feeding system to prevent the material from being damaged and no second pollution. 4.The fan device can ensure not to damage the material, add tension of material, avoid shifting direction of material, and keep good effect.